GRIEF can affect us all in different ways. Many of us struggle to come to terms after the loss of a loved one. It is at this time, we need care and support. With this in mind a Donegal Hospice Bereavement Support initiative will be up and running from this weekend. The Hospice Bereavement Support has been set up to help people experiencing difficulty/pain due to the loss of a loved one through empathy and understanding. Eight Hospice volunteers have been trained to help those bereaved and grieving. Death is a fact of life that we are all faced with, though the circumstances may vary. All of us experience the loss of someone close to us at some time, together with the grieving that follows. This will vary in time and intensity from person to person. “Whether death is sudden or expected, it is normal to experience feelings of loss, shock, disbelief, anger, guilt, depression,” Hospice Chaplain Kathleen Doherty explained. “The circumstances of death and the age of the deceased have bearings on the intensity and the ability to deal with bereavement,” she added. The Hospice Bereavement Support will be available at the hospice centre, home care, community care, palliative care and day care. 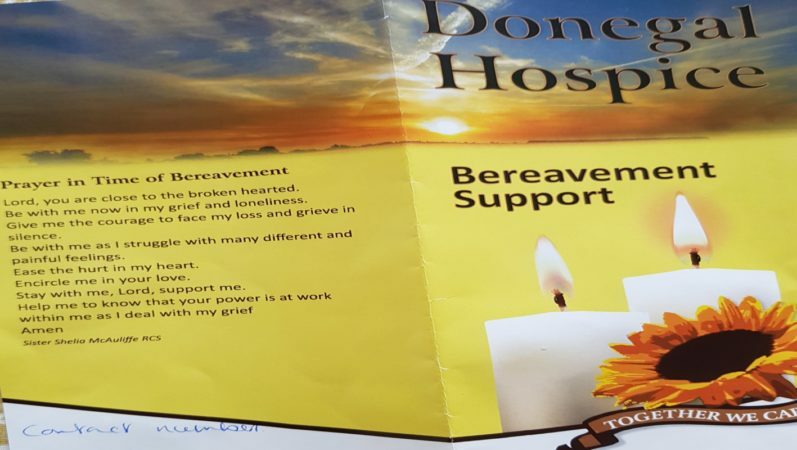 “Six weeks after the death of a loved one, Donegal Hospice Bereavement Support will send a sympathy card and provide information about help available,” Ms Doherty said. “We will have 11 trained volunteers by the end of next month. The idea has been growing gently over the past two years and we have looked at what other hospices’ are providing in different parts of the country,” she added. Full details of the Bereavement Support will be made available to church congregations, pharmacies, secondary schools and GP practices’ all over Donegal in the coming week. The Donegal Hospice Bereavement Support will be launched this Sunday as part of the Annual Remembrance Service at the Church of the Irish Martyrs from 4pm.